STARS had a very eventful ALA Annual in Las Vegas. 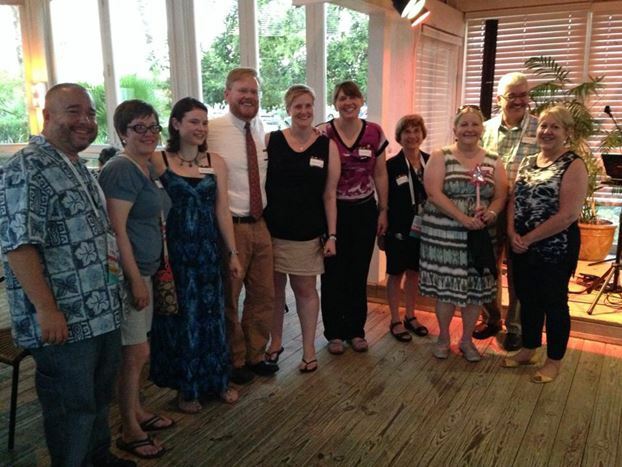 In addition to terrific programming and discussion groups, the section celebrated its 10th Anniversary. It was a wonderful party and a great opportunity for our members to connect. Nearly every STARS Chair â€“ past, present, and future â€“ was in attendance, and it was a great visual representation of our history. My sincere thanks to the planning committee that put together the event! My additional thanks to Past Chair Nora Dethloff for her leadership throughout 2013-2014. Photo: Past, present and future chairs of STARS at the 10th Anniversary Party â€“ Tom Bruno, Tina Baich, Nora Dethloff, David Atkins, Heather Weltin, Sherri Michaels, Denise Forro, Margaret Ellingson, Tanner Wray, Mary Hollerich. Photo taken by Joe Thompson, RUSA President. There is much more to come for STARS this year as we work to provide professional development opportunities and helpful resources to our members and the resource sharing community at large. Here are just a few of our plans for the coming year. The Codes, Guidelines, and Technical Standards Committee will be working diligently on the revision of the ILL Code for the United States. Weâ€™ll be looking for feedback from the resource sharing community at some point in the process, and I encourage you to participate. The Education & Training Committee will once again be providing the FREE â€œEverything You Always Wanted to Know about ILLâ€ workshop at ALA Midwinter. Watch the e-mail discussion lists for details. The ILL Committee is planning an ALA Annual 2015 program titled â€œAcquisitions, Collection Development, Electronic Resources, and Interlibrary Loan, Oh My! : Connecting Users to What They Want!â€ I think this is a timely program as the lines between collection development and resource sharing continue to blur. The Research & Assessment Committee is planning an ALA Annual 2015 pre-conference focused on ILL data, a topic that is always a big hit with our resource sharing colleagues! Though Iâ€™ve been placed at the helm of STARS, I obviously canâ€™t do all this alone. Luckily for me, our section has the most engaged and dedicated members Iâ€™ve ever encountered in a professional organization. Iâ€™m excited to begin my year as STARS Chair and look forward to working with each of you as we move STARS forward!